78ct. 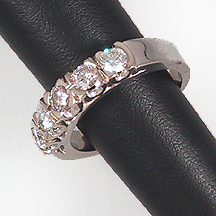 tw five stone 14k white gold fishtail band GH-SI. Please let us know a ring size. Price subject to prior sale. We continue to make this band regularly, but it is always a little different. It is always around three-quarters of a carat. Available in white or yellow gold.